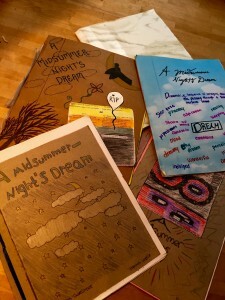 In a classroom where visual literacy is explored, poetry is another ancient art form charged with potential. Good poems ask the reader to see and hear. 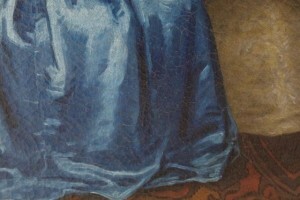 From Emily Dickinson’s “I dwell in possibility” to Charles Bernstein’s “Of Time and the Line” poets see the poem as a vibrant opening of the possible. 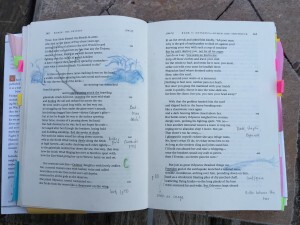 The exercise of moving a poem to the page is not complicated. Too often we feel intimated by poetry. We worry about students not getting the sense. 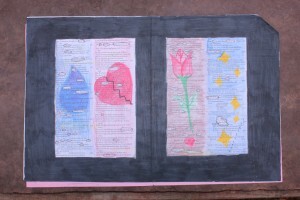 Consequently, we look for ‘easy’ poems where we understand every literary element. 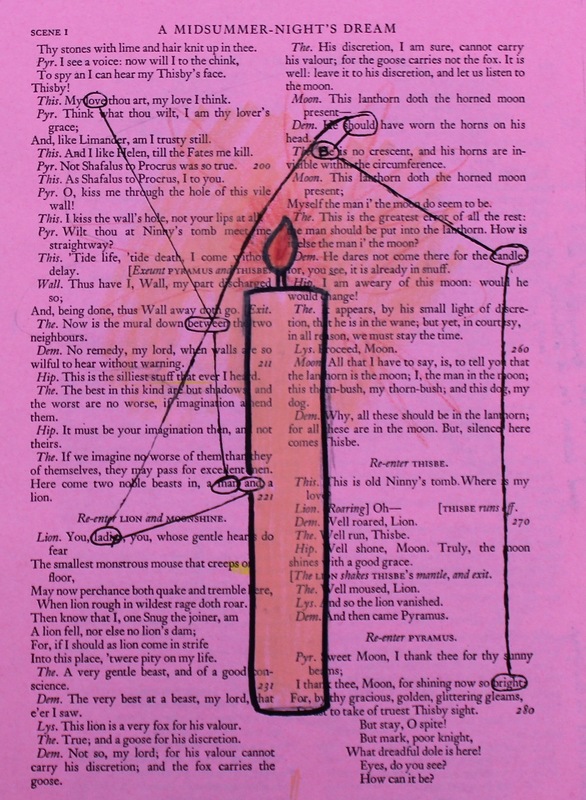 We can treat poems too mechanistically to the point of analyzing the life out of each line. 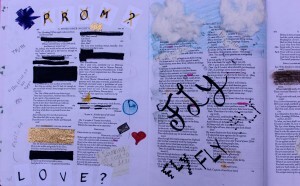 Or choose poems we don’t think needs much interpretation, almost self evident. If poetry is an art of possibility, should it be for readers? Throughout the year I choose different kinds of poems, depending on the class, their interests, grade level, and/or unit we are studying. I typically provide a copy of the poem to the class so we can work the text, annotating, writing, underlining, circling or doodling. I read the poem aloud, we have some class discussion, and I give some cultural context. I encourage students to observe, interpret, and respond. I make sure at some level they understand and experience the unique logic and beauty of poetry. This last quarter we read T.S. Eliot’s The Love Song of J Alfred Prufrock and then I asked them to make a visual interpretation of the poem. After some basic discussion about components of composition — such as rule of thirds, the numerous ways the page can be divided to create effects, how placement of design, color, and words work to visually persuade — I asked them to make a visual reading of the poem using both text and the page in their journals. 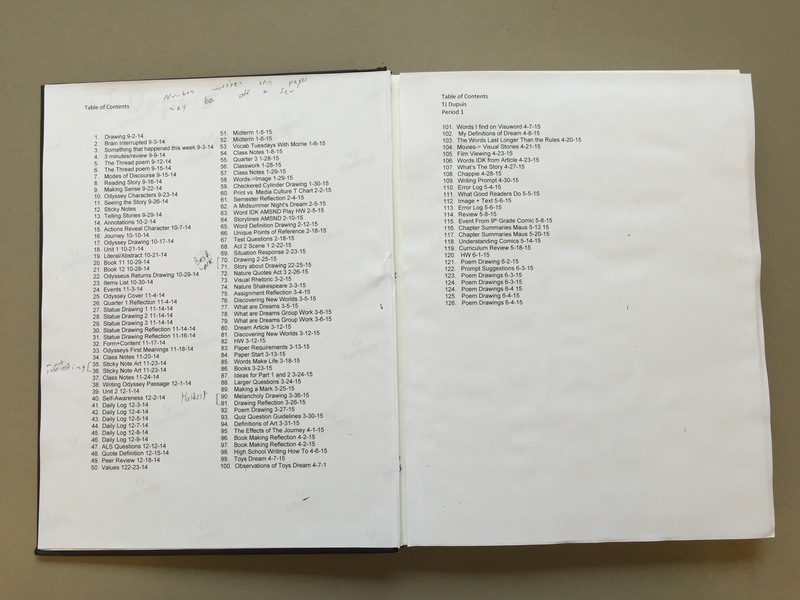 If these pages could sing, what would we hear? O the delight of reading and marking a text! 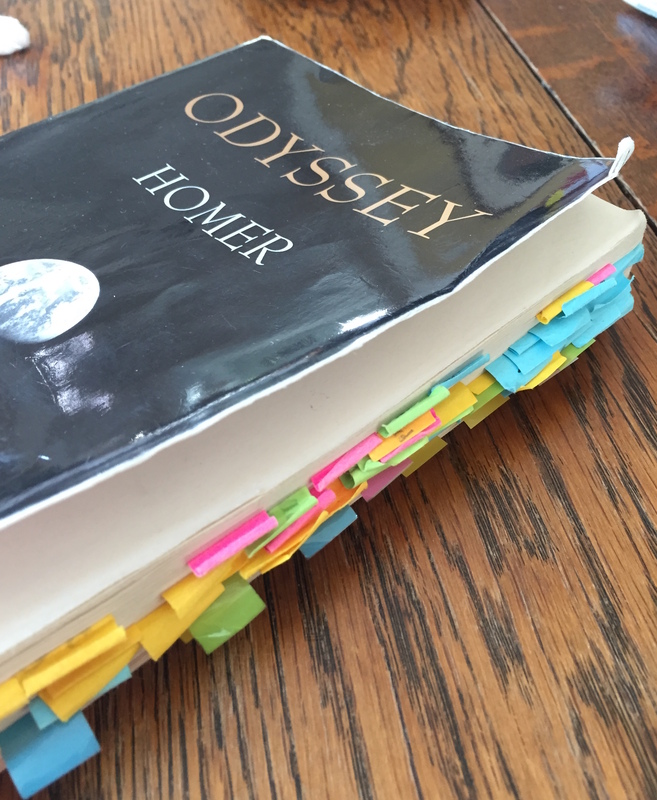 Each year I try to transfer this delight over to the students by establishing a range of annotative practices. 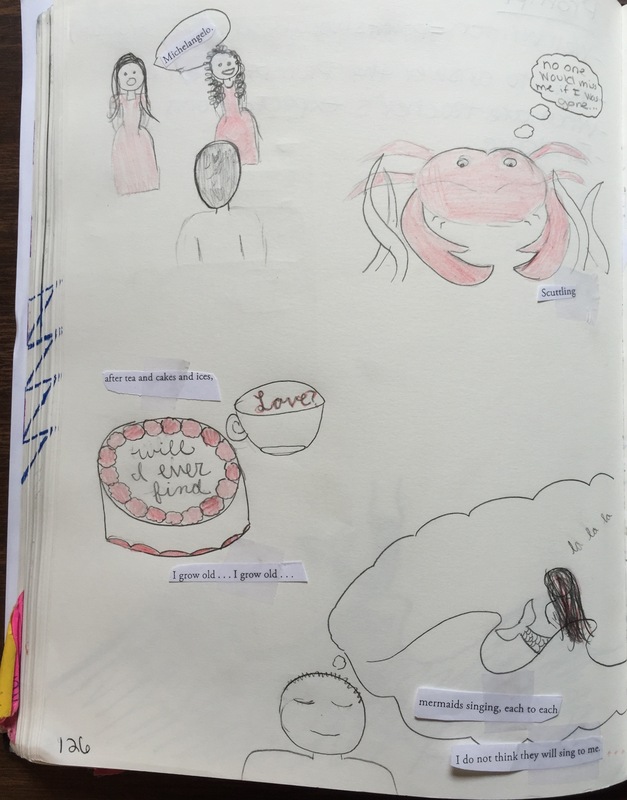 I explore the many ways we might fused together words and markings, how we might give a visual record of the reading experience. Our day to day world is filled with visual, textual, sound, and interactive ‘texts’. This multimodal discourse dominates student lives, and is also a part of the history of books and reading. 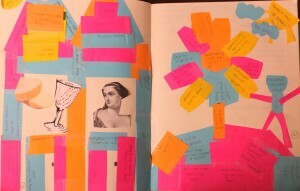 In fact, we still have ‘visual’ books everywhere — from children’s books, graphic novels, to vibrant digital nodes. 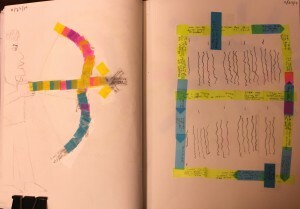 So, a question arises for me: Is there a way to weave together critical and creative annotative skills with the history of the book and ancient practices of reading? A further question also arises which the students may not ask, but one that I ask myself: Why do this at all? What is the purpose? We are all about words and deeds in our daily life, so why not in reading and writing? What happens when we see what we say? 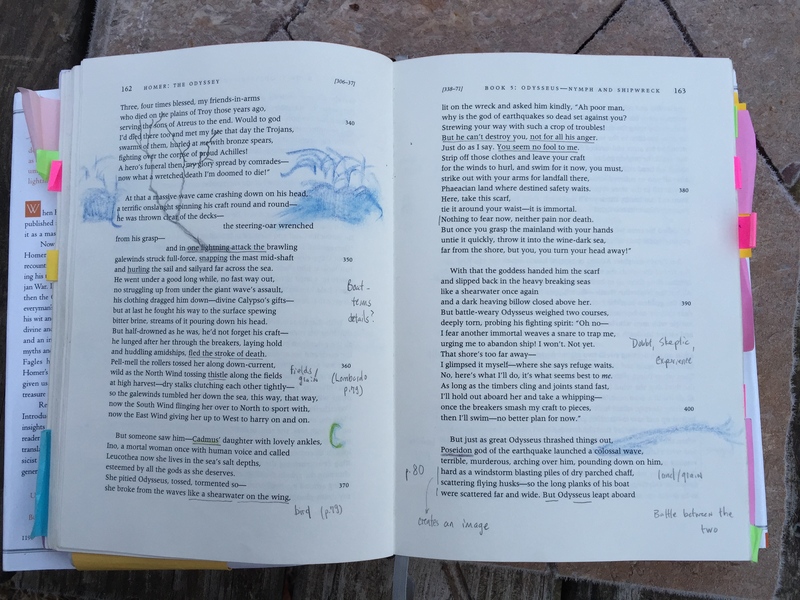 Although the thought of teaching Shakespeare may seem daunting, I have found curious ways to enter into the text that adds a visual dimension to the task of reading. 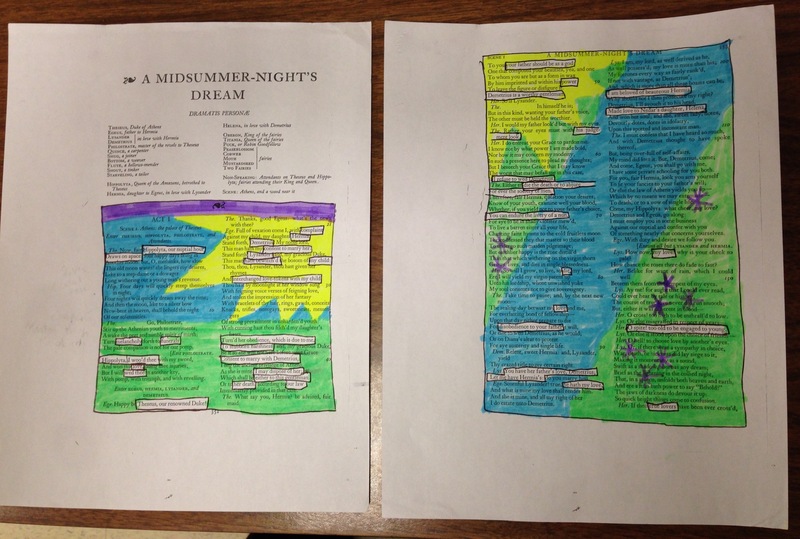 We read A Midsummer Night’s Dream using various literary strategies that foster creative and critical experiences. 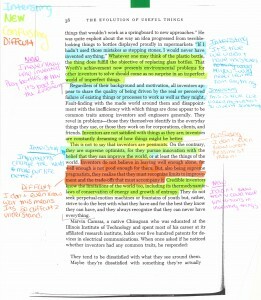 We annotate, discuss, write, listen. We are not seeking a perfect understanding of all of Shakespeare’s nuanced story-telling, but rather a level of authentic participation where students find ways to enter into the story. After we finish reading (using our loaned books), I photocopy the entire play and give a copy to each student. As a side note: one problem with reading in High School is that students don’t own their books. 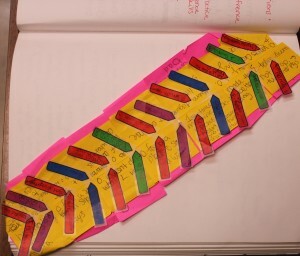 In the real world, real readers mark their texts in a variety of ways. 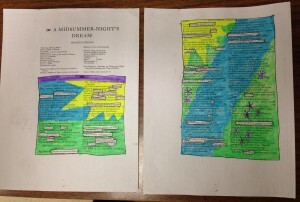 By second semester the students comfortably and confidently annotate texts. But, I want to keep the story going and not wax into a dull, mechanical practice. 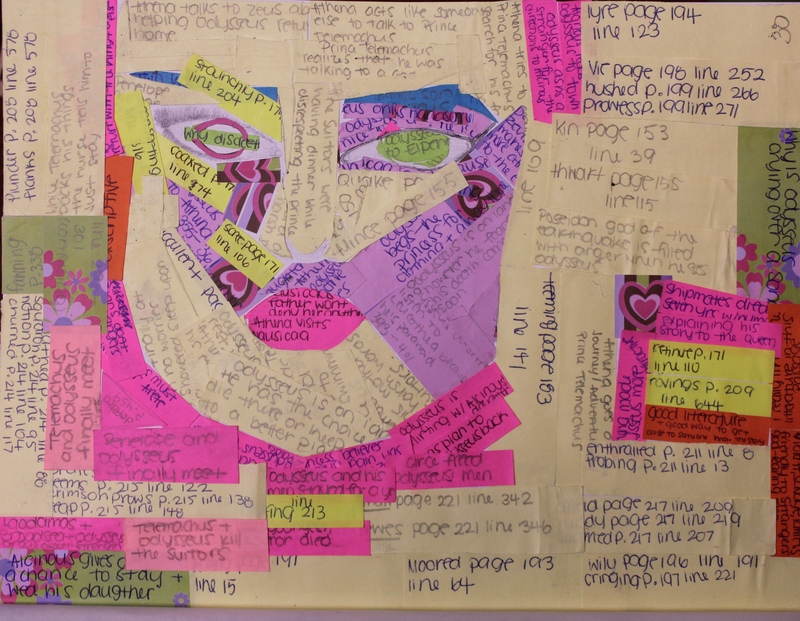 So, I give them an assignment that simply asks, ‘What if we made art out of our visual record of reading?’ You can imagine their first responses! I won’t go into all the details of the assignment, but here’s a glimpse. Each visual work was unique. 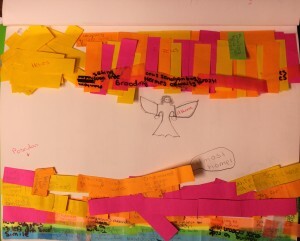 Some students drew; others wrote and pasted. 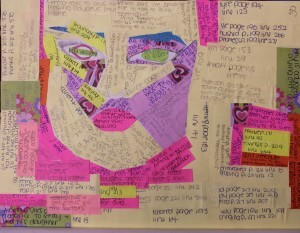 All of the students were thinking how the text could be imagined (as we do when we read). 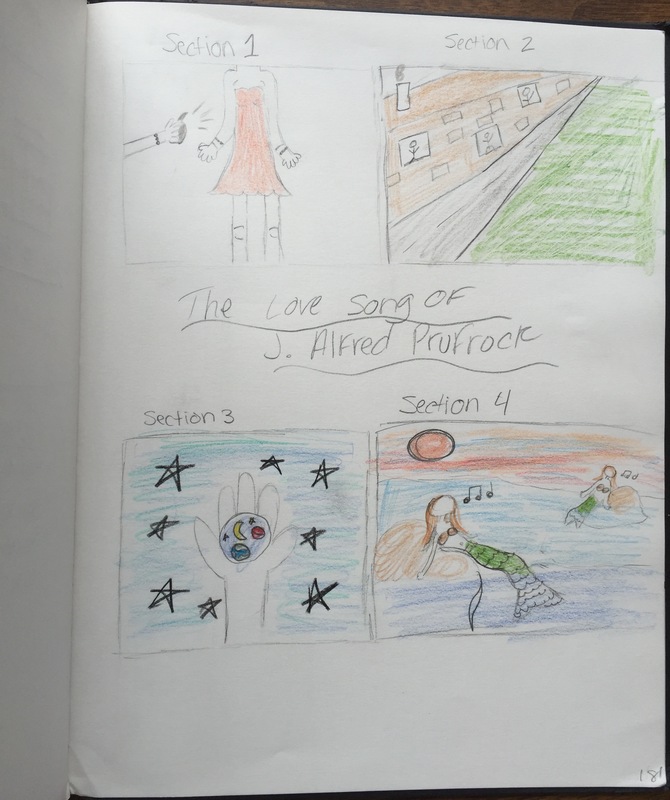 Upon completion of the assignment, each student holds in their own hands, their ‘reading’ of the play. 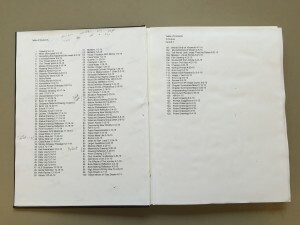 The word on the page hums and the work of the heart and mind fuse into unique physical book. Below, we see the word and the design in a new, yet old light. These wonderful students working at their desks at home, bringing their work into class, showing their peers, step into first hand the joy of the book, the page, the word. Now, click on the image. We are still reading by candle light. O the delight! Each year after we finish a book I recollect them. Each time I collect the books the students have to remove their annotations. 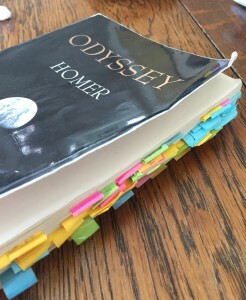 Usually when I collect The Odyssey from my 9th grade English class, I can see all their various vibrant sticky notes. Last year as the class began removing their ‘reading work’ notes I knew then I wanted to do something more with the process. I took a few photos. Still, I was sorry they were losing all this work. When we own and mark texts we also have a range of visual reminders. 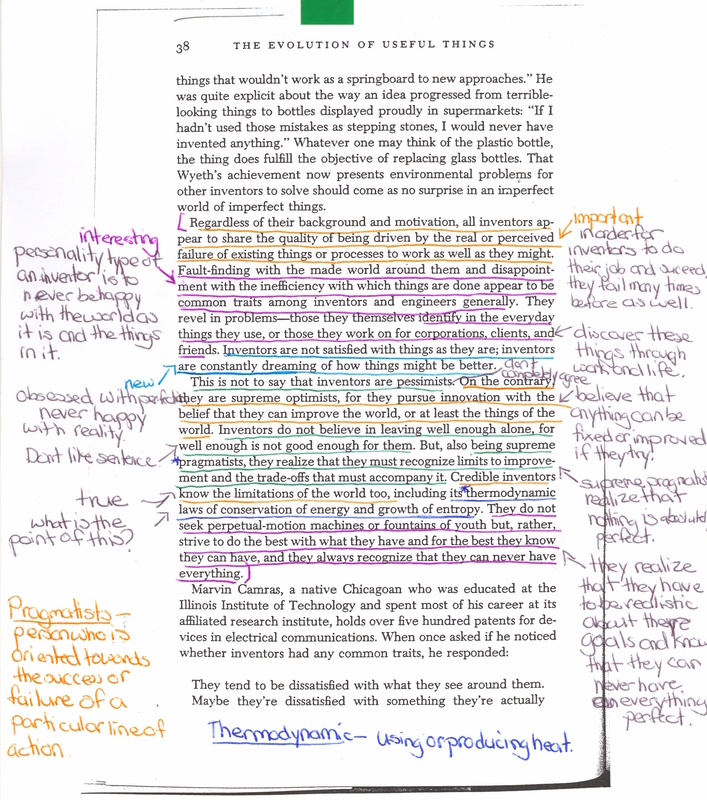 I have had students annotating texts for years, using a variety of methods, styles, structures, and designs. 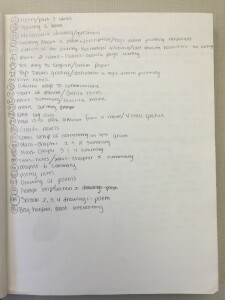 Marking a text, making a visual mark. Getting rid of the annotations seemed problematic. 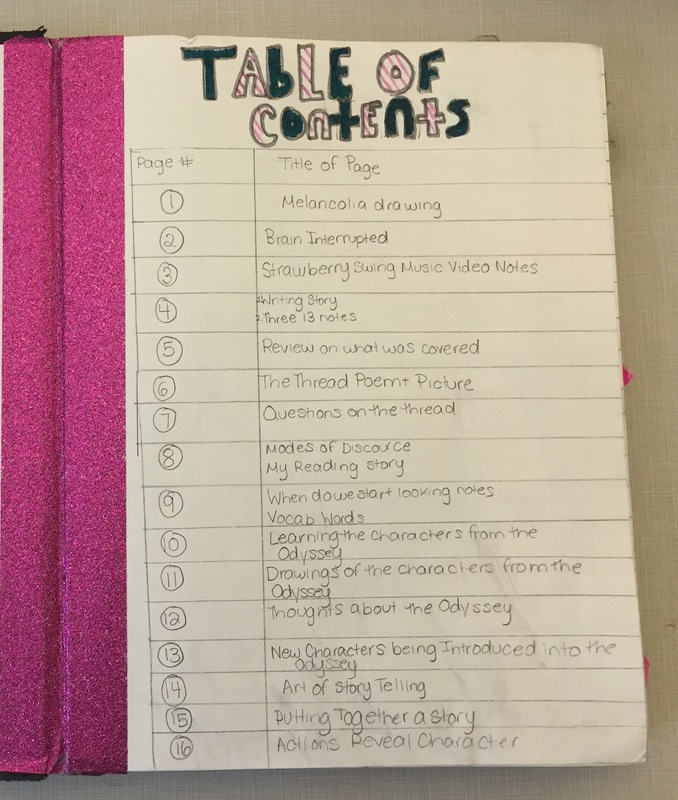 If reading is an ongoing experience where we never know how long a word, a phrase, a dialogue, a description will linger with us, could we find a way to have fuller reminders in class, for individual readers? I will collect your book on Monday. 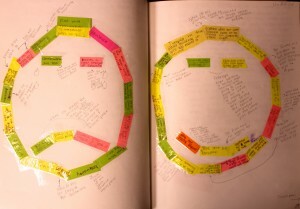 Over the weekend I would like for you to create a work of art using your sticky notes from your reading work. 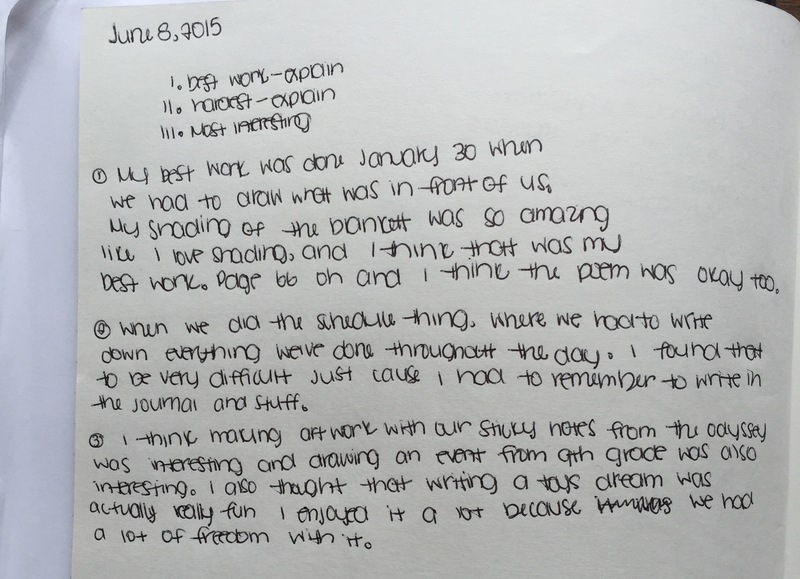 The work should be in your journal. 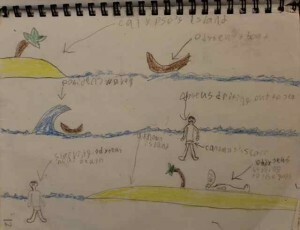 The art should tell the story of your journey reading The Odyssey. 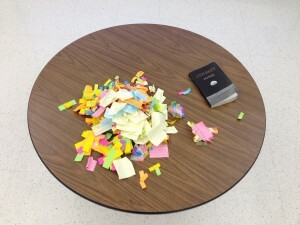 You will need to use all your sticky notes. You may additionally draw, glue, and/or design. 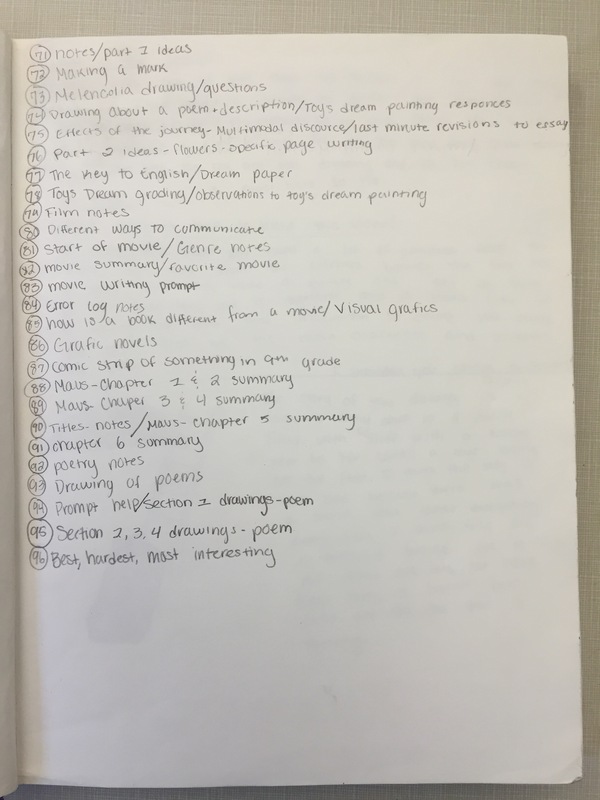 I will need to see specific details about your annotations in your work of art (the type, the book references, the purpose, etc). When I collect your books on Monday all sticky notes should be removed. I wondered over the weekend how the assignment would be realized. I was very confident in them, but less confident in my idea. Was this too much? 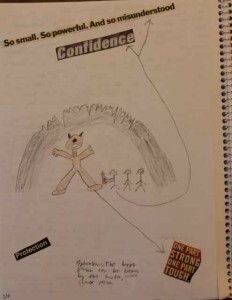 Students provided explantations of their argument, of their design methods and their aims. As seen above, many found ways to weave together the story of The Odyssey with the story of their reading process. Reading as a boat, a maze, a tree, a change, a journey. 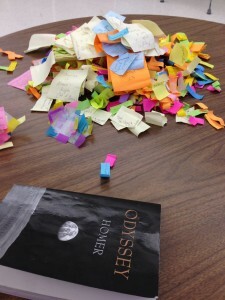 And like Odysseus their annotations found a place to rest, to live. They took the opportunity to abstract their reading work even further in remarkable ways. This story of the story teaches and delights– not only their audiences and themselves, but now also the world, our world. 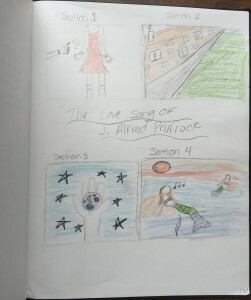 When we think of visual design and books, we might consider children’s picture books, or comics. If we have happened upon an exhibit on or offline, we might recall illuminated manuscripts. We have such a wonderful history of visual texts and the contemporary examples for readers of all ages abounds — think Dr. Seus, Simms Taback, Rosemary Wells or Chris Ware, Marjane Satrapi or even Tom Phillips. Easily accessible, all these words and images can seem distant from any kind of classroom practice. 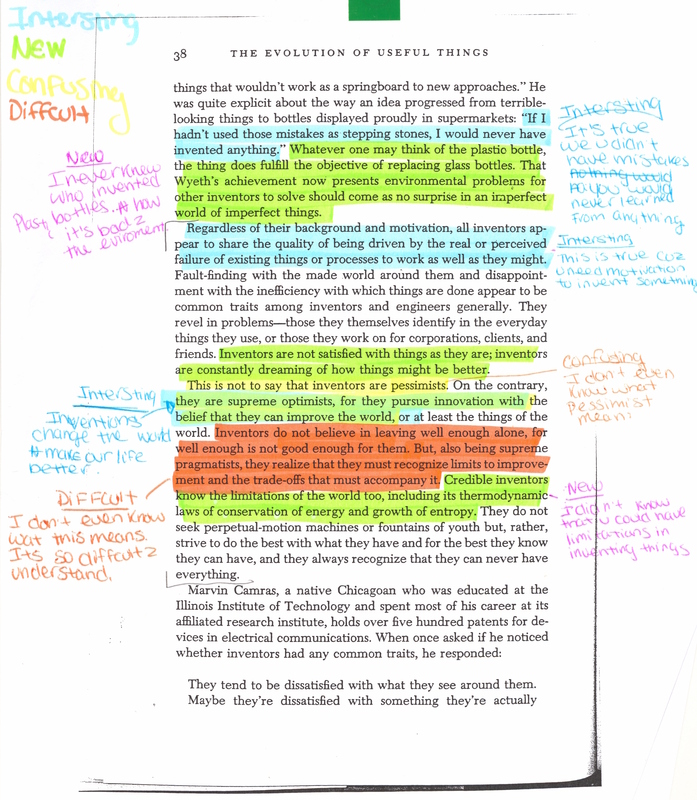 Years ago in conversation with a friend during a seminar on reading and writing, we discussed a method of annotating texts. 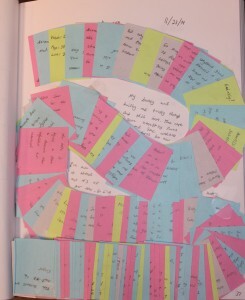 From this delightful conversation, I began to experiment with colors as a way of marking texts. 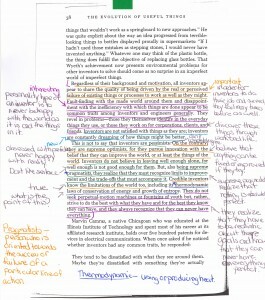 So, for example, if I were to ask students to annotate parts of the text that seemed difficult I would request highlighting in a particular color with some comment. 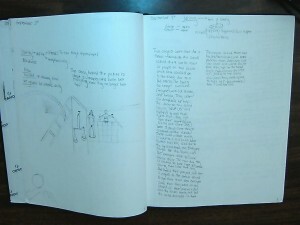 As you can see below, the text/ the essay becomes it’s own visual record. I can’t tell you how many texts I’ve seen highlighted in yellow with little or no explanation. 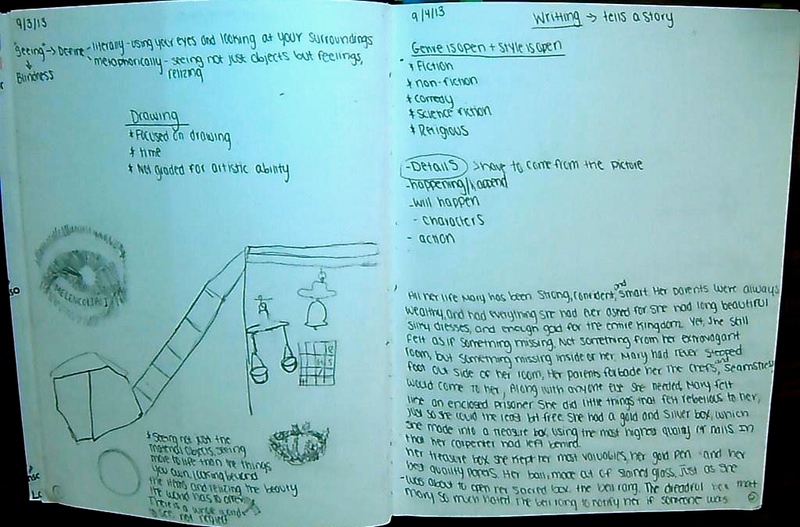 Strong readers often mark texts and this visual work is deeply linked to the reading experience. 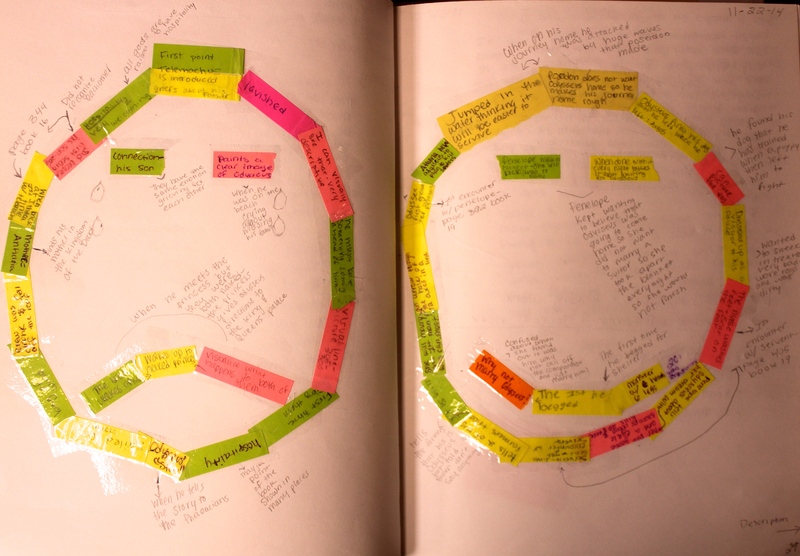 Considering annotation as a critical and creative activity, we can design and practice this skill in a multitude of ways. 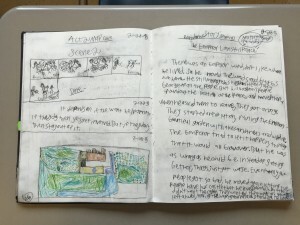 And, once again, as we link student’s visual experience into their ever growing language arts skills we strengthen their ways of interacting and communicating with the world. The 20th Century British poet knew of the gap between our eye, our mind, and our hands. This gap, quite apparent at the beginning of the school year awaits our response. 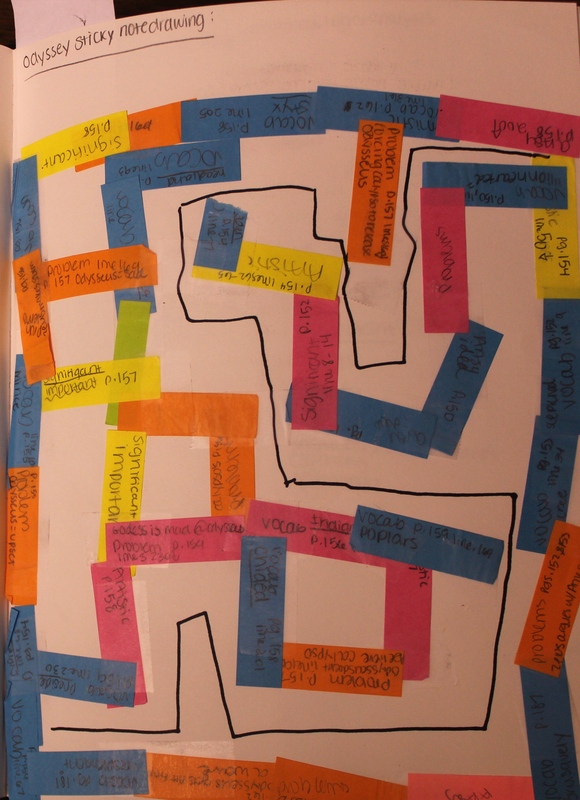 Integrating a visual strategy into your class can begin anywhere. 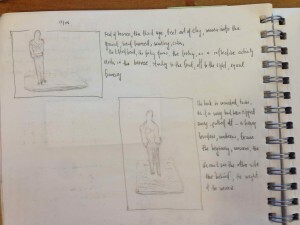 The point is to start looking and start connecting looking to seeing, seeing to drawing, drawing to words. For the past two years I have started with Albrecht Dürer’s Melencholia I (Albrecht Dürer – Melancholia I, 1514). I don’t spend a lot of time discussing the work of art as a cultural object; rather, we use the work of art as a beginning of seeing and thinking. I have chosen the print for a variety of reasons. First, it is a significant work of art that continues to inspire conversation. Many have tried their hand at its composition. 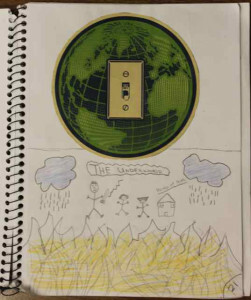 The image also covers a range of objects and ideas: students can draw the entire piece or focus on one particular element. The image can handle sustained observation and the longer you look, the more you see. The drawing work leads to conversation: What did you see? 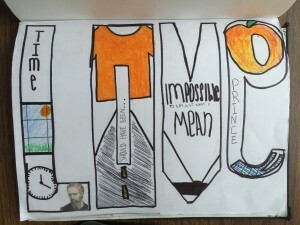 What did you draw? Why are these objects together? What does melencolia mean? I then can ask the question (and one we will be asking and discussing all year): In what ways is seeing literal? In what ways is seeing metaphorical? Recently I spent time looking through the archives. 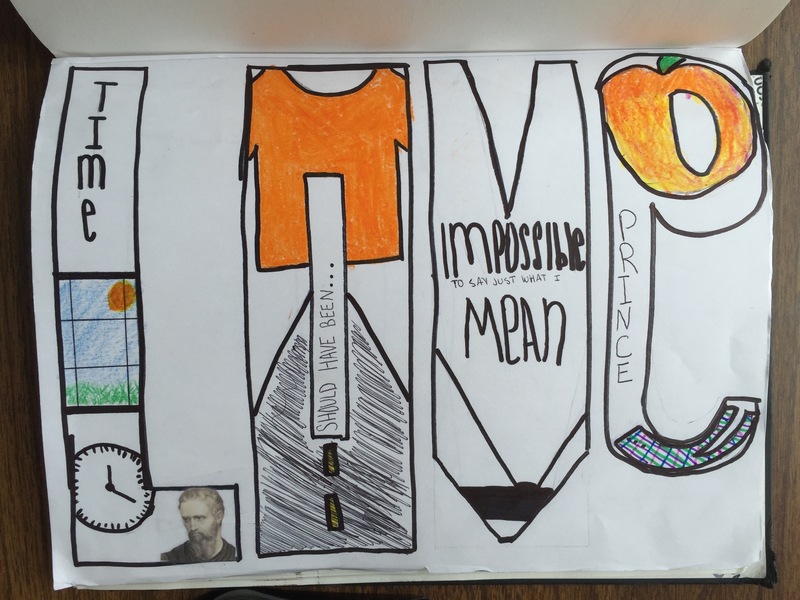 * I was curious about the writer Henry Peacham – his work on rhetoric has had a large influence and in searching the collection, I discovered he also wrote on drawing and painting. In The Gentleman’s Exercise (1694) he covers a range of topics from exercise to illness, from drawing to recipes for creating color for painting. Reading his descriptions on how to mix materials to create array of colors I came to a simple realization: when we look at a painting we are often looking at the unique mixing of a particular color. The museum then is not only a place of visual meaning, but also a site of visual making by particular human agents located in a specific time and place. 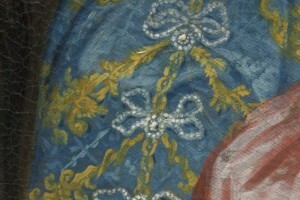 Color here is linked to a person and a composition, not a digital formula. A museum hums conversations of color. In the age of screens (even with retina), paintings –as acts of color making –are translated in a plane of sameness. Machine color is amazing. Human color authentic, located, aging, limited. When you have a chance, go to the museum. More than ever, we need to see the physical design of color. 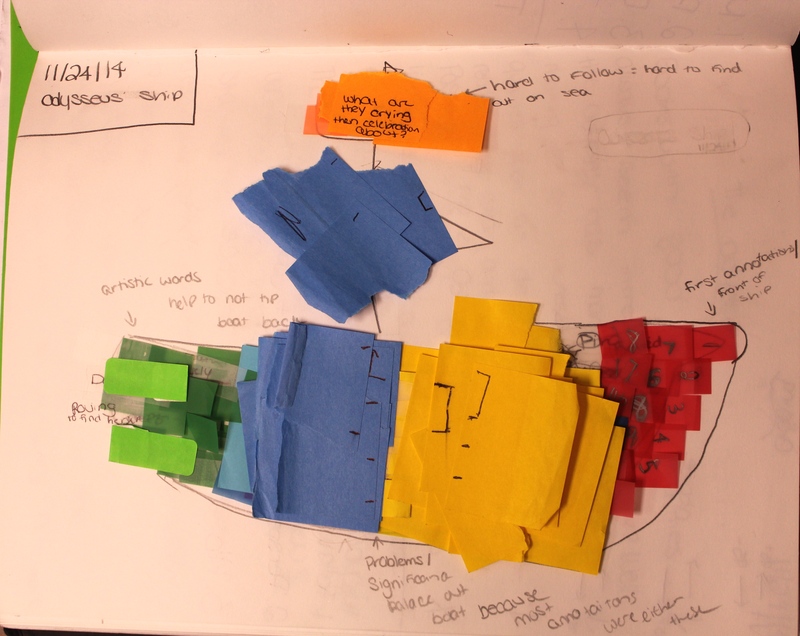 Composition and color are structural markers similar to narrative devices. What colors are used for somber, gleeful, mysterious, industrial moments? Color is not singular, but plural. When we say ‘blue’ we have a host of blues. Seeing these blues in a museum expands our visual terrain. 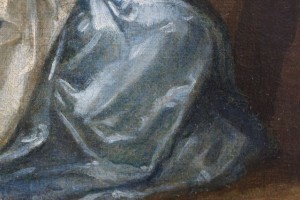 A place where the constant play of context, space, light, and size of the canvas affects our seeing. A direct physicality emerges beyond the reach of mediated machines, like this one. 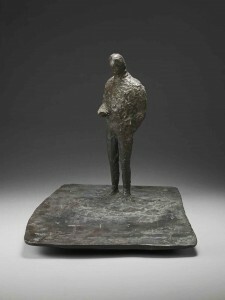 The museum space fuses with our perception, our day and our space. We don’t just see once. We can see blue on our screens. Yet, do we ever think of making blue? With making comes choice, volition, effort, trial and error, quality of material products: the variables increase, and now as we look we can see that artists have a certain color design, a certain way of using the canvas, the brush, the elements. We realize that a color like blue is also a multifoliate human narrative. 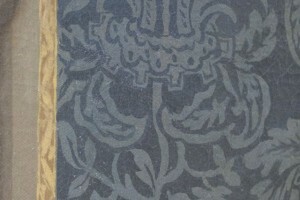 *See Rare Books and Manuscripts and the Reference Library and Archives for more information. All photos were taken on April 16th, 2014 on the fourth floor. For a wonderful history of the color blue, see Blue: The History of a Color by Michel Pastoureau (2001). 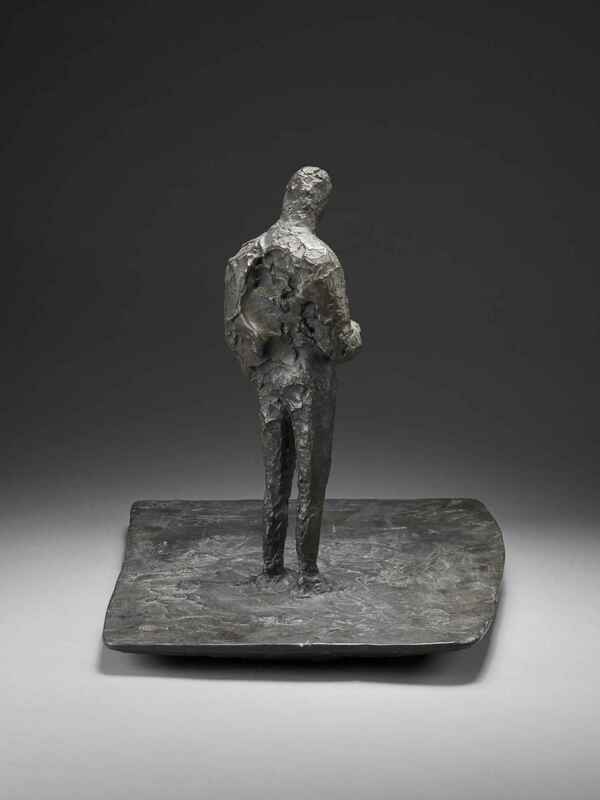 Here’s a classroom activity using Reg Bulter’s Man (early 1960s) from the online collection. Lesson: Explore the value of location, view-point, and narration. Draw image (10 min) whole or detail. Respond in writing to the following questions (5 min). What is the mood? What is the story? 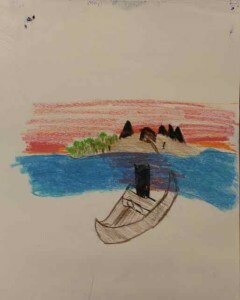 Draw second image (10 min) whole or detail. Respond in writing to the following questions (5 min): What is the mood from this perspective? What is the story? Draw third image (10 min) whole or detail. 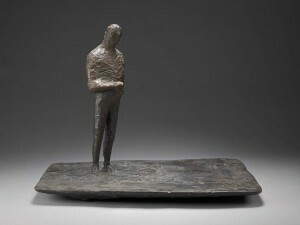 Respond in writing to the following questions (5 min): What is the mood from this perspective? What is the story? Reflection and follow up: If you had only seen one of these images what would you know in terms of mood and story? In what ways might we use our classwork today towards understanding the effect of location, view-point, and mood when we read literature? When viewing works online? When reading a news story? Example: Although I generated the lesson for the students and their needs, I too benefit from ‘seeing perspective’ and participating with them. 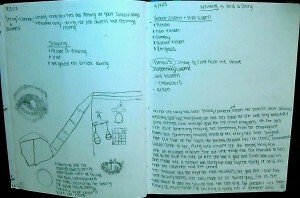 Here’s a clip from my journal covering two of the steps. The activity generated quite a bit of conversation in the classroom the following day. 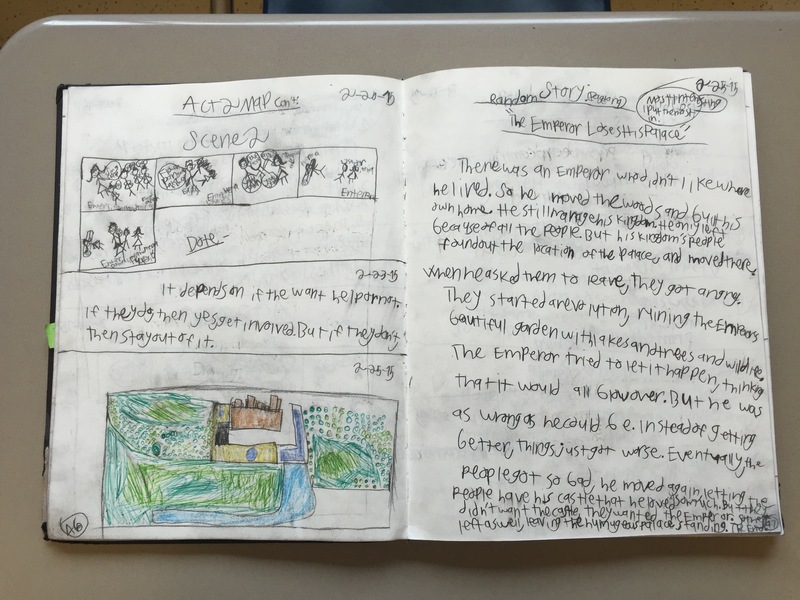 Students gained perspective on a range of skills and frameworks — from seeing perspective to the role of location in story telling. 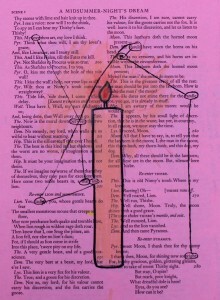 Poetry is one of our oldest image-makers. Words paint. Readers imagine the world of the text. 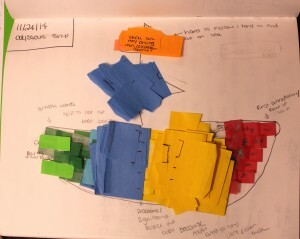 What if we tapped into this visual process and redirected the output? 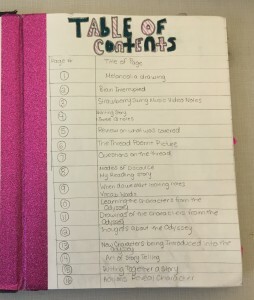 What if we began asking readers to ‘give us a picture’ of what they ‘see’ as they read? What do these words see? And later, how might words show a place or an emotion? Poetry attempts to alter our perception through words. 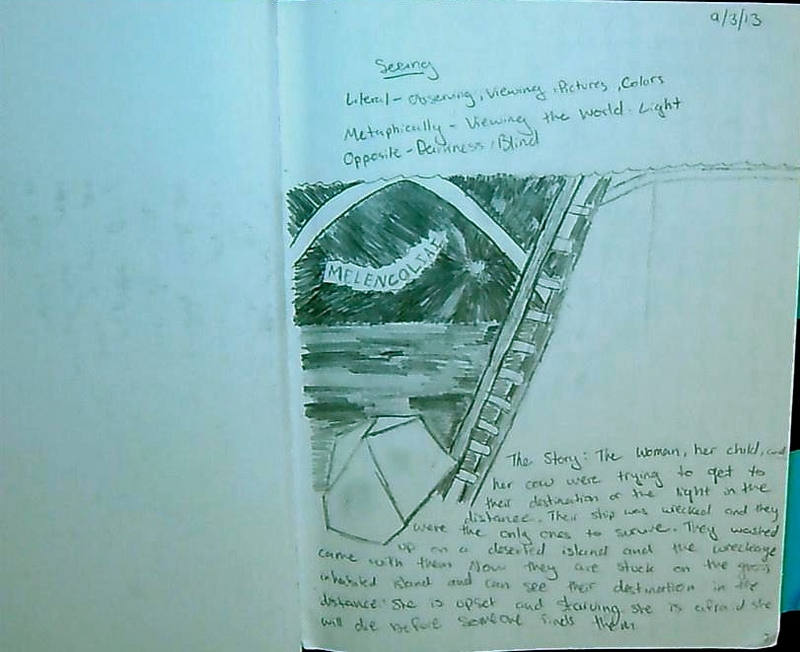 By asking students to draw what they see in a passage or a chapter we bring them into the poetic process. 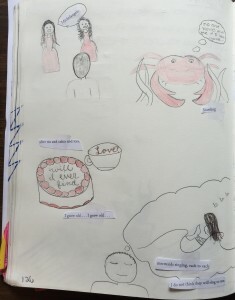 Creating a classroom where these drawings are shared and discussed situates each member of the class as an image-maker. 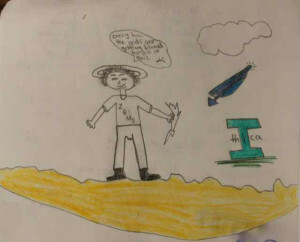 By establishing various drawing activities within the study of the language arts we encourage students to explore other versions of ‘image-making’. The imagination has another platform. Students have access and place to continue the conversation. In class students discussed their planning (“pre-writing”) for their design as well as their hopes (the effect on the audience). Everyone had words to add. Later in writing they pursued this question: In what ways did the activity alter or enhance your understanding of the passage or reading itself? You may discuss your own work or work of your peers. ➜ We abstract from letters, worlds. A salient feature of strong reading is ‘picturing’, a fostering of words to create a visual terrain in our heads. We stroll along in a story, adding detail after detail, slowly shaping, ‘drawing’, or seeing a room, a chair, and conversation. We hear the words in what we imagine. We abstract from letters, worlds. A process in time. A skill in need of practice. 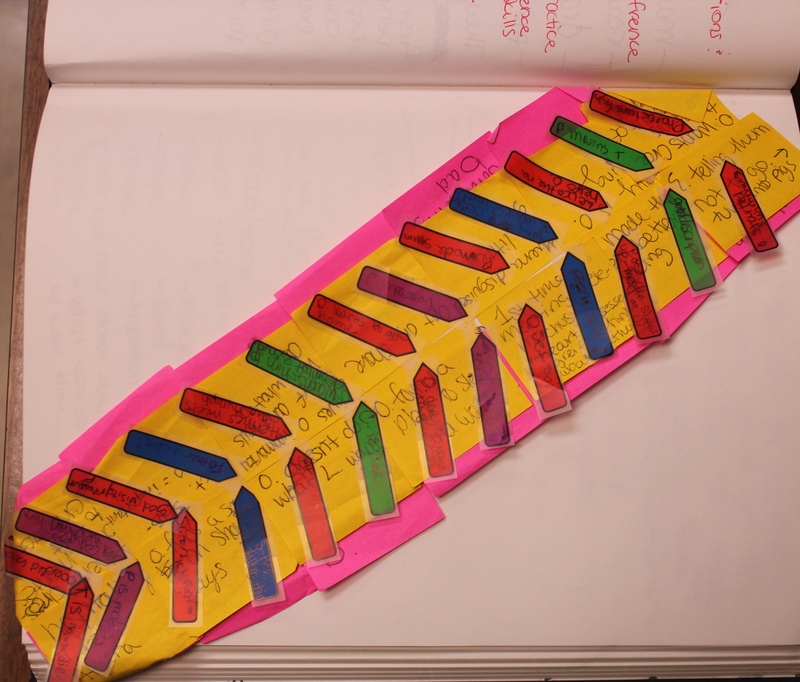 As teachers we want to cultivate this participation, this move from letters on the page to figures in our minds. How might a visual activity bring to light the power of words, the power of participation? 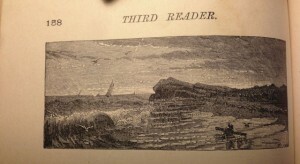 Even in the 19th Century in our School Readers and Primers we wove together words and images, picturing and story, seeing and telling. Here’s one example from a Appletons’ School Readers Third Primer (1887). Continue reading We abstract from letters, worlds.